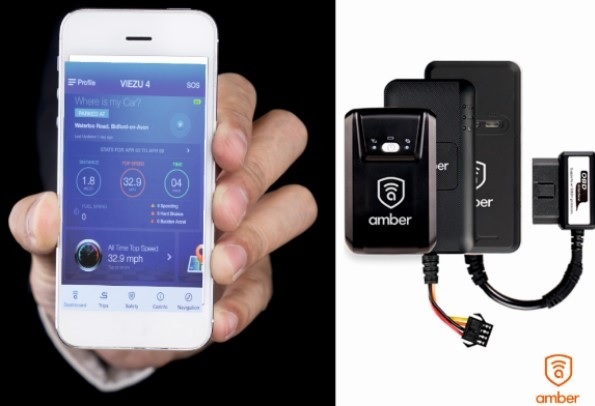 Keep track of your valuable vehicles & possessions with Amber Connect, the revolutionary new range of vehicle tracking devices from Viezu Technologies. Amber Connect GPS trackers sync with a smartphone app or cloud-based web portal to provide advanced analytics and reporting on how your vehicle is being driven, journey logs and fuel expenses, harsh acceleration and braking and whether your vehicle has breached predefined geo-fences or perimeters you have set for it. Initially developed after demand from Viezu’s fleet customers for a cost-effective means of tracking their fleets and drivers, Amber Connect is just as suited to customers with one or two vehicles who want to keep track of them. Maybe your vehicle is being driven by someone who has just passed their driving test, or an elderly parent who is still driving but perhaps you think shouldn’t be. Maybe your vehicle is regularly ‘borrowed’ by work colleagues, friends or parked by valet parking? Are you concerned about how it’s driven when it’s gone in for a service? Or is your vehicle simply your pride and joy and you want to keep it safe from theft? Amber Connect wired devices are wired in to the vehicle offering the advantage of being able to shut the engine down remotely via the Amber App in the event of theft, unauthorised use, poor driving or if the vehicle breaches any defined geo-fences. The App sends push notifications to make vehicle owners aware of any of these situations. Amber Connect devices are also available as wireless versions, which are portable, making them extremely useful for keeping track of more than one vehicle, or for assets which are unpowered – for example, trailers, caravans, expensive leisure equipment etc. Amber Connect tracking devices are available from £140; a SIM card is required for data transfer and these are available from as little as £2.50 a month on a pay-as-you-go basis, making tracking your precious possessions very low-cost! And with no contract tie-ins and extortionate monthly fees, it really is a ‘no brainer’ when you consider the cost of the vehicles and possessions you want to track. For more information about Amber Connect tracking devices, please visit www.amberconnect.co.uk, call 01789 774413 or email sales@amberconnect.co.uk.